Strong? Heroic? Athletic? Nothing like that, this is Mr.Skulla! Enter into his mansion and help our skeletal friend to pass through 20 levels of puzzles using different gimmicks and avoiding dangerous traps! Be careful, however: Mr. Skulla cannot jump! You'll have to rely on your brain to get out! This looks well detailed for a 2D game. It's very cute!! Like a nes game!! 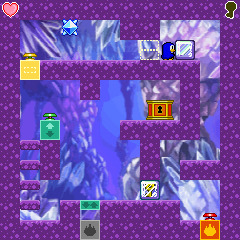 It's the first time that I see a platform style for a puzzle game. It's very cool. A perfect work. Is all original?